As Google’s front page reminds us, today is the birthday of famous painter Paul Cézanne. 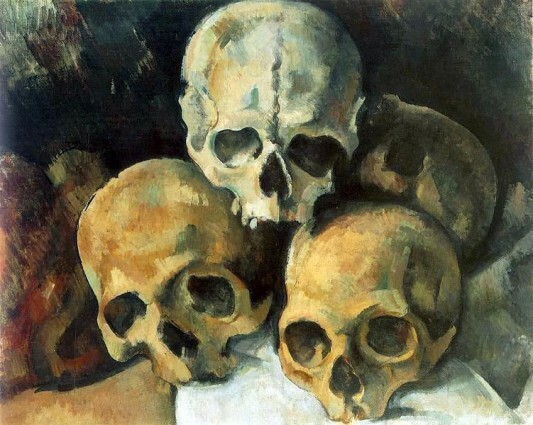 While Google decided to use Cézanne’s still life of fruits and tableware for their Doodle, I chose to feature one of the artist’s darker pieces, Pyramid Of Skulls (1901), because, well, I just think it’s so metal. The artist did plenty of other still life paintings of skulls, some of which have skulls and fruit in them. The 19th-century French Post-Impressionism painter was born 172 years ago on January 19, 1839. His work influenced other great artists, such as Pablo Picasso and Henri Matisse, and art movements like Cubism.